"(Rick Hendrick) sacrificed a lot for me, and believed in me when a lot of people didn't." Last weekend’s Dover race was certainly unusual. For the first 350 or so laps, the only cautions were the stage breaks, and Kevin Harvick dominated. But sometimes things just don’t go your way even if you led for much of the race. At about the same time, the “Big Three” of Kyle Busch, Martin Truex Jr., and Harvick all had trouble at the same time. Busch and Truex received penalties and Busch had issues with his track bar, while Harvick had to pit again due to a loose wheel. This resulted in a mad dash to the finish featuring Aric Almirola, Kurt Busch, and Chase Elliott. After Clint Bowyer ran into issues, it became a race of strategy at the end. While Almirola and Busch pitted, Elliott took the lead. What happened next provided a last minute plot twist as four Playoff drivers (Almirola, Truex, Brad Keselowski, and Alex Bowman) crashed and set up a duel between Elliott and Denny Hamlin. In the end, it would be Elliott, who stayed out, outlasting Hamlin at the end and earning his second career Monster Energy NASCAR Cup Series victory. The win also moved Elliott into the Round of 8, avoiding the randomness of Talladega next weekend. As one of the most popular drivers on the track, Elliott’s win resonated with a lot of people. In fact, Elliott’s so popular that his win caused the Dover Downs casino to lose money on NASCAR betting. With sports betting becoming more and more accepted both in society and the eyes of the law, Dover International Speedway and the Dover Downs casino (which is situated in the backstretch) took bets on the track grounds. Elliott got a bunch of bets thanks to people betting on their favorite driver and at 10/1 odds, the casino lost between $3k and $4k according to SBJ’s Adam Stern. Given his recent improvement and the fact that he’s peaking at the right time, it may be a good option to bet on Elliott to win this year’s championship. 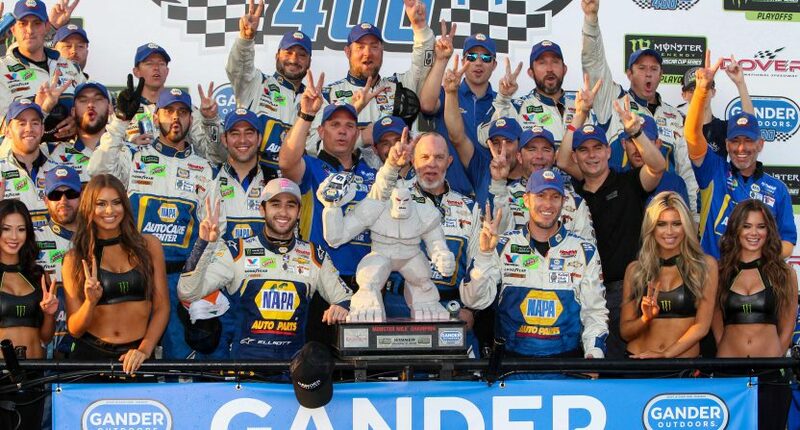 The Comeback spoke to Chase Elliott about his Dover win. We discussed how it felt to win in front of Rick Hendrick and how he’s the only one who doesn’t have to worry about winning at Talladega. Phillip Bupp: First off, congrats on the win. How did it feel that you didn’t have to wait as long getting your second win, as you did with the first? 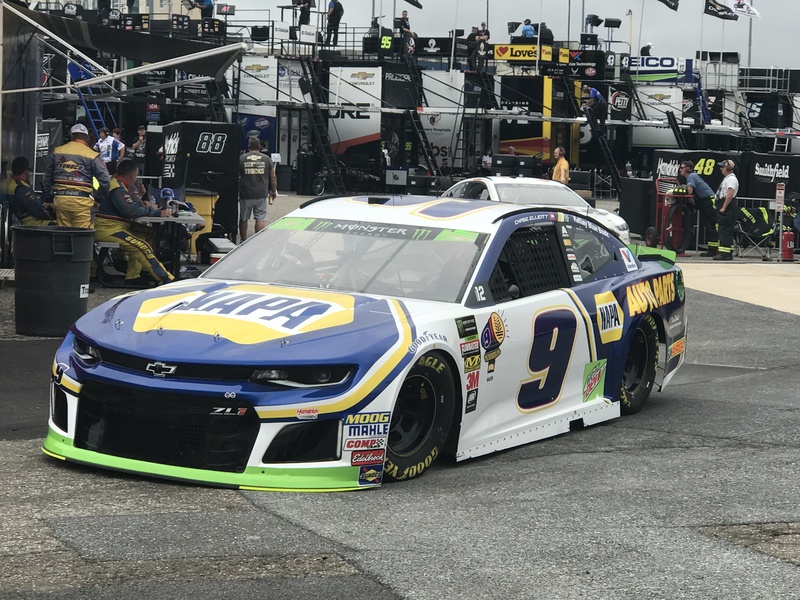 Chase Elliott: Yeah, it’s great. Nice to kind of have a little bit of momentum left over. I feel like from Watkins Glen, and obviously with the Playoffs starting, I feel like everybody has kind of entered a new mindset in these final ten weeks. And the intensity ramps up. People are certainly racing with a different attitude than they have throughout the year. So, it’s nice to be able to kind of start that, and have a decent first few races. Had a good run going, a couple of them, and not a very good result. But then be able to start this next round, and being able to go ahead and move on is great. You know, to not have to sweat throughout Sunday (at Talladega) quite as bad, and worry about the crashes, and things taking you out of it is great. So, looking forward to the opportunity, and trying to win some more. PB: Did this win feel differently than the one at Watkins Glen? Elliott: Yeah. I think, yeah, definitely. I mean, I think anytime you win they’re all, it seems like in the past they’ve all been kind of different. And just the circumstances were certainly different. Last fall, having the opportunity to win Dover last fall, and for me to mess that up like I did, you know, and be able to come back, and have another opportunity to win there in the same race was just nice. And just glad that I had the chance to go, and do it again ’cause that’s not always the case. PB: Did you feel like you got a bit of redemption this year compared to what happened last year? Elliott: Well, I felt like we had an opportunity to win, and it worked out. I just think you have to make the most of your chances ’cause who knows if you’ll ever have another opportunity, or when that’ll come. Just, yeah, don’t take it for granted. PB: And despite your mom and dad not being there, Rick Hendrick, and Jeff Gordon were. It was an emotional scene afterward. How was it to win in front of Mr. H? Elliott: It was awesome just because he wasn’t at Watkins Glen. And you know he’s, I mean, really opened the door for me to be where I am today. And like I said there on Sunday, I don’t really know where my career would have ended up without him stepping in when he did. Yeah, he’s done an awful lot for me. He’s sacrificed a lot for me, and believed in me when a lot of people didn’t. You know, along the way. And people kind of hunt for reasons not to in my position. And I’ve always appreciated that, and I’ve always appreciated my opportunities, and try to make the most of them. Yeah, just thankful for him, and what he’s done for me. PB: How’s the camaraderie between you, Ryan Blaney, and Bubba Wallace? You’re not teammates, and Ryan even races for a different manufacturer but the three of you very much have each other’s backs, and are really psyched for each other when one of you wins. Elliott: I mean, yeah. We’re certainly all good friends. And we enjoy hanging out with each other outside of the racetrack. But I think we all kind of understand the on-track stuff, and what’s at stake. You know, I mean, we all want to outrun each other, and there is just too much on the line to give too much, or take too much, especially at this time of year from even your friends. So, we all understand that. And I don’t expect anything differently from them, and they shouldn’t from me either. This is not a time of year where you mess around. PB: You’ve got a two-race winning streak among the three of you. So, it might be a trend. Elliott: Yeah, hopefully so. Hopefully, we can keep it up. PB: Dover has been a great place for you, and you have an incredible record there. Statistically, it’s probably your best track. What is it about Dover the clicks for you, and makes you a favorite for the win each time you’re there? Elliott: I mean, to be honest with you, I really don’t know. They were asking me that after the race on Sunday, and I really don’t know why that track has been good to us, and what not. But yeah, just always enjoy going there. I ran, I remember running some K&N races up there and I didn’t really like it a whole lot then. But when we got in the truck series, and started running, I kind of started to enjoy it more. And enjoy it more so on the Xfinity side. And I certainly enjoyed it on Sunday. I just like racing there. It’s a fun track, it’s a good size, and challenging, it’s very physical, and tough, and demanding. Those are the kinds of places you, as a racer, enjoy to go to. 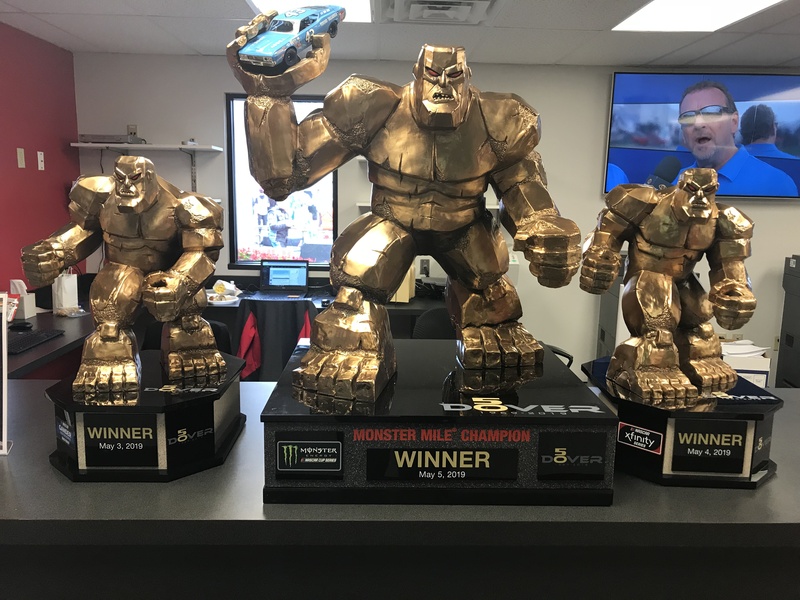 PB: The Dover trophy is one of the more unique trophies in NASCAR. Do you have a place in mind where you’re gonna put the trophy? Elliott: I’m not sure just yet, but yeah it’s a great trophy. A great honor to have that trophy. It was just funny looking at that thing. I’ve realized Jimmie’s got ten or eleven of them at one racetrack. So, just wild to think about that. But yeah, I don’t know, we’ll see. PB: Next year you’ve got the gold one. So, you’re gonna have to go and try and win that. Elliott: Yeah, I like that gold one. They had it out at the driver’s meeting there on Sunday, and I saw it. And I was like, “Man, I wonder if that’s for today.” And they told it was for their 50th anniversary next year. But yeah, that’d be awesome. I’d love to have one. PB: Now back to the race. Going into the next to last restart, what was going in your mind when you stayed out, and most everyone else pitted? Elliott: Oh, I honestly thought that staying out was the right move there at the end. There were no more laps that were left. I was surprised that many guys were gonna pit. I just didn’t feel like with, you know, seven, five to seven laps left, that if you did have fresh tires, you’d be able to move your way back forward fast enough. So, I’m glad that those guys did something different, and gave us the opportunity to grab a win. PB: Track position was that important at that time? Elliott: Track position is always important. PB: For sure. My biggest takeaway from the end of the race was, given your past history of bad restarts late in races, you did put in two great restarts on older tires, and drove away from everyone. Did anything change that helped you improve your restarts? Elliott: I think just a little confidence. You know, in having been in those positions before. I certainly learned lessons the hard way, and had opportunities to win, and messed them up. So, you just try to think about that stuff, and what you did wrong, and what you could do better. And if you’re placed in those positions again, what you can do to kind of change your result, and have the outcome go your way. That doesn’t mean you’re not gonna make mistakes ever again, but it certainly means that if you are in a position that you’re familiar with, you can try to do better, and luckily it worked out that way on Sunday. PB: I’m sure now that you’ve been in Victory Lane, that kind of pressure is off of you. I don’t want to say it factored in, but it kind of took that away for you to think about, and you could just do the job. Elliott: Yeah. I just think it just gives you some confidence that you have a little bit of history in those situations, and have some successful history there. Yeah, looking forward to hopefully being in that spot more often. And that’s really the only way to get better is if you are in those positions more. And yeah trying to capitalize on it. PB: Final question, I know you mentioned this earlier on. But what’s it like to not be under any pressure at Talladega? Elliott: Yeah. Well, Talladega, you know, it’s a, it’s still an important race, and there is still a lot of points to be gained. We’d like to have some more playoff points. I think this next round is gonna be very difficult as well. I still view Talladega as an opportunity to win. And certainly nice to not have to worry about it if you do have a bad day, or get caught up in a crash, you know, to play the points game. But yeah, I’d still like to go down there, and grab another victory ’cause we need as many of those points as we can get. PB: Time to play spoiler, and keep the others from getting playoff points, huh? Elliott: Yeah, that’d be great. That’s the goal.